Mitsubishi Motors today announced the start of production of its European-spec i-MiEV new-generation electric vehicle along with production of PSA Peugeot Citroën's Peugeot iOn and Citroën C-ZERO at its Mizushima Plant. Mitsubishi has been producing and selling the Japan-spec i-MiEV since last year. With the production of the European-spec models, MMC begins full-fledged export. In fiscal year 2010 (April, 2010 - March, 2011) Mitsubishi plans to sell 5,000 i-MiEVs overseas, this includes models built for PSA. At a ceremony at the Mizushima Plant, MMC President Osamu Masuko stated "It has been 100 years since mass production of internal combustion-engine cars began. 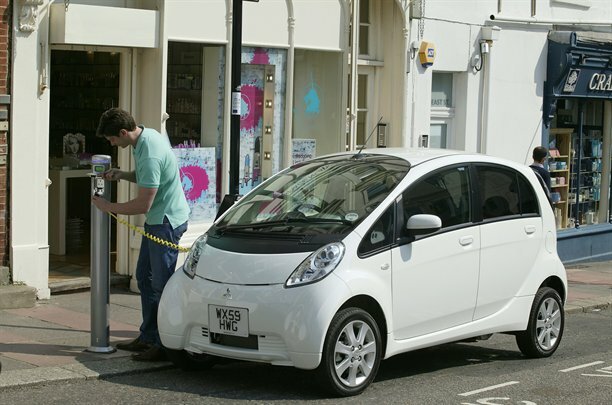 We have taken the first step into the next 100 years of the automobile with the i-MiEV. Today, we take the second step with production for the European market on the way to global rollout of electric vehicles. This is a big step for the automobile industry and at the same time signifies the beginning of e-mobility for Europe." 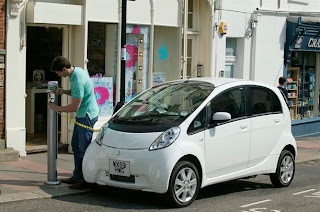 Mitsubishi plans to sell the i-MiEV in Europe in 14 countries including France, the United Kingdom, and Germany from this December, then from fiscal year 2011 sequentially expand the countries it will be sold in. Compared to the Japanese version, the European-spec i-MiEV has been altered to better suit European requirements, including: a different front and rear bumper design, added safety features such as Active Stability Control (ASC) system, new gear selection, an all-new left-hand-drive dashboard, etc. The European-spec i-MiEV also achieves a cruising range of 150km under the European NEDC driving pattern on one charge.